There are many different marketing ways that can be used to market our businesses. One of these most effective tools is email. It is not just inexpensive, but is readily available. The use of email marketing tools is getting the attention of most marketers as it is the most convenient way to market your brand. In fact, research shows that there are three times more email accounts than Facebook and Twitter accounts combined. Third-party email software such as Makesbridge, iContact, and MailChimp helps business owners manage, target, and track email campaigns. 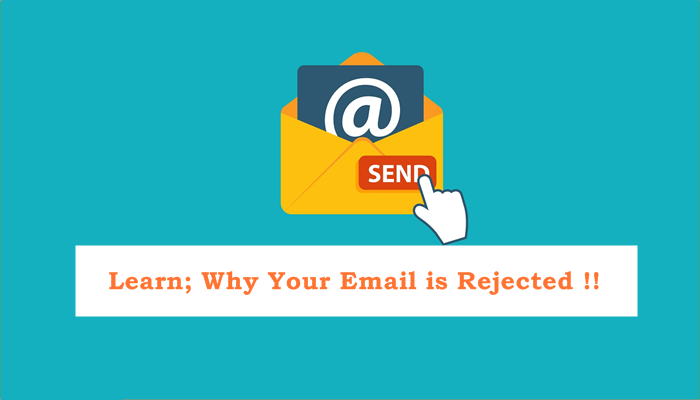 However, a common issue with sending emails is its rejection. There’s nothing worse than to check your emails only to find that annoying email from last night trying to get back into your inbox for a second round. Here are 9 common reasons emails fail to perform as hoped. If someone has signed up for your mailing list through your website and then subsequently you send them emails with the same or similar information that is on your website, it is likely that several will unsubscribe. Likewise, sending multiple emails with a similar message could cause you to lose recipients. You have to create interesting content to retain people’s attention. The recipient needs to find time to quickly browse your email; therefore, you should keep your emails short and to the point. Link to a page where the recipient will learn more. Or you can do some research on engaging content and provide some thought-provoking ideas, suggestions and solutions. In other words, if your content is not up to the mark and engaging; the obvious result is rejection. To plan better content, follow our content marketing principles for 2015. Your recipient’s involvement with your email begins before it’s ever opened – with the subject line. Most of these are riding on 50 characters or less. Some classic subject line “don’ts” include: boring duplications, ALL CAPS, unnecessary exclamation points, and, obviously, misleading messages. The title “Warning “or “Re:” may earn you an opening, however, it won’t earn you customers. A few marketers go too far to build a connection with their receivers. It’s fine to adopt a caring tone when sending emails, yet it’s over the top to continue as though a recipient is a critical, lifelong friend. Your customers don’t care that you’ve recently had a new baby, or that the second anniversary of your company’s launch is heading up (unless you offer them something as a part of the celebration). People are tired of emails that promise untold riches in return for doing practically nothing. If your email content does not live up to the promise in your title, or it is clearly more of the typical fluff, people will unsubscribe or mark them as spam. Are your emails long, dry, and/or boring? Visualize that the recipient is searching for her shoes, her dog is barking to be let out, and she’s late for a meeting. She doesn’t have a year to spend interpreting and investigating your jargon. This is your chance. Don’t waste it. The most ideal way is not to be adverse about using a bit of “edge,” a human touch, or even a fun, irregular inclusion. Also, don’t write a novel; the faster you get to your CTA (when you request a second date), the better. To do that, just follow the best practices for email marketing. Irrespective of the possibility that the product or service you offer is truly better than that of your competitors, criticizing them will seem petty and childish. Point to the positives in your own product rather and illustrate to consumers why you are the best. Your audience doesn’t need emails about how you’re redesigning your building, or how your organization has celebrated its fourteenth month in business. Save these sort of updates for your blog or social media posts or for a telephone call with your mother. Keep your emails about the reader. They must be inspiring and interesting to people who aren’t yet 100% invested in your brand. It’s an oversight to use emails to create sales. Emails are a marketing tool where you let people think about marketing, free trials, or new products and services. They should be directed at tackling recipient issues. Save the sales pitch for your website pages. Or if you want to add decent calls to action, highlight the benefits and advantages instead of just the cost and price. Don’t forget to share the post with your friends and network. Additionally, If you think we missed some point, don’t forget to update us on Twitter, Facebook or LinkedIn.